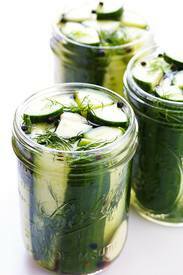 This Easy Refrigerator Pickles recipe from Gimme Some Oven only takes about 5 minutes to prep, and makes perfectly crisp and delicious pickles that you’ll LOVE! With literally just about 5 minutes of prep time and a few days marinating in the fridge, these delicious pickles will be yours to enjoy! You'll love them because they’re nice and crisp (not soggy), perfectly vinegar-y (feel free to experiment with more or less vinegar to find your preference), definitely garlickly, and they have a hint of a kick from the black and red pepper. Absolutely delicious.